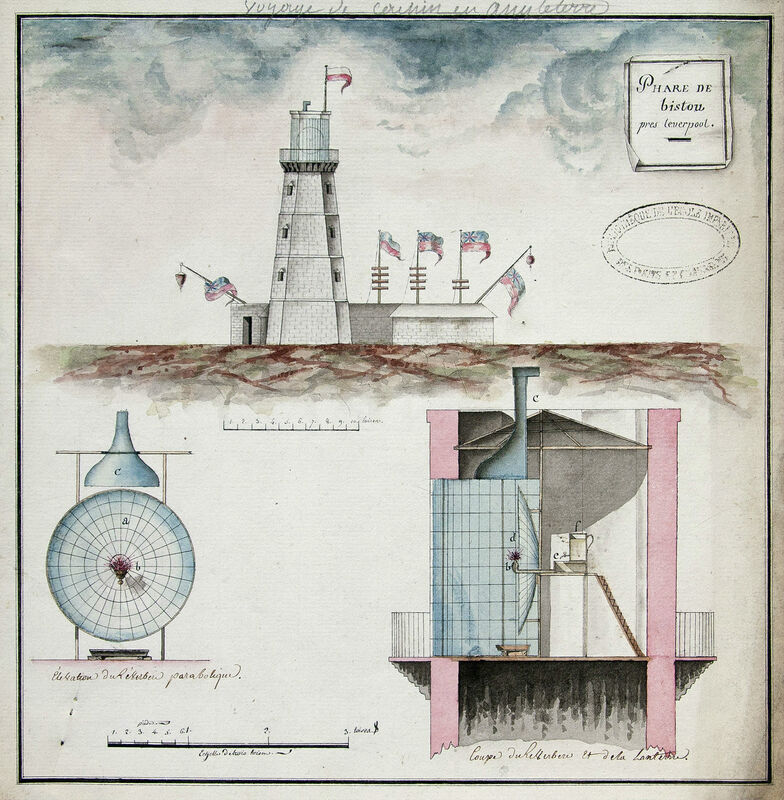 In 1785, the French engineer Joseph Cachin drew this delightful illustration of Bidston Lighthouse. Cachin’s careful drawings include a scale, and one can take measurements from them. The scale is in toises and pieds du roi. These units were used in France before the Revolution. There were twelve pouces in one pied du roi, and six pieds du roi in one toise. Pouce, pied du roi and toise correspond respectively to the Imperial units inch, foot and fathom, but were slightly longer. Thus one toise was 1.066 fathoms, 6.394 feet, or 1.949 metres. If you measure the diameter of the reflector in the drawing using Cachin’s scale, and convert back to Imperial units, you should get a value very close to 12 feet. This is the size that William Hutchinson reported in 1777 in his Treatise on Practical Seamanship, but less than the thirteen-and-a-half feet reported by Robert Stevenson when he visited Bidston Lighthouse in 1801. Perhaps Stevenson was more casual while he was still learning the trade of lighthouse-engineering, for he seems also to have exaggerated the height of Leasowe Lighthouse. Bidston’s reflector was (probably) the largest parabolic reflector ever to be installed in an operational lighthouse. It was also one of the first – Hutchinson installed parabolic reflectors in all the Wirral lighthouses about the same time. Hutchinson’s breakthrough in lighthouse optics was driven by the needs of Bidston Lighthouse, which was built further from the body of water it lit than any other lighthouse in the world (a record it holds to this day). As far as I know, Cachin’s is the only drawing to show a cross section of the lamp room, with the stairs that the keeper would climb to replenish the oil reservoir, and the elaborate chimney through which the smoke and vapours of the lamp would escape. My thanks to Thomas Tag of the United States Lighthouse Society for bringing the drawing to my attention. This entry was posted in History, Lighthouse, News and tagged BidstonLighthouse, catoptrics, History, lighthouse on 18th May 2015 by admin. Thanks for posting this most interesting (and illuminating) information – Seeing this precise drawing serves as a reminder that not everything that is written (eg Stevenson’s comment on the size of the Hutchinson reflector) should be taken as being 100% accurate.